Dr. Evelyn Thomchick is an associate professor of supply chain management in the Smeal College of Business at Penn State University. She is a research affiliate at the Larson Pennsylvania Transportation Institute and the Center for Supply Chain Research at Penn State. She has served on doctoral and Master's students' committees in business, engineering, and education. 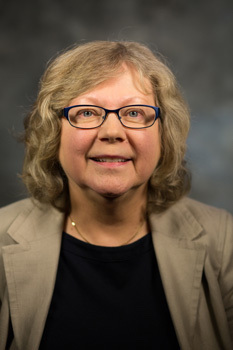 She has taught a wide variety of courses in logistics and supply chain management and is currently teaching graduate courses in strategic procurement in the Penn State World Campus Master of Professional Studies in Supply Chain Management. In July 2009, Dr. Thomchick was selected to be the editor of the Transportation Journal, owned by APICS Supply Chain Council. She was elected to the APICS Supply Chain Council Board of Directors in 2016 for a one-year term and now serves on the APICS Research, Strategy, and Innovation Committee. My research interests are in international logistics and supply chain management, transportation policy, and sustainability issues in supply chain management. Introduction to the strategic framework, issues, and methods for integrating supply and demand management within and across companies. SCM 800 Supply Chain Management (4) SCM 800 provides an enhanced understanding of key principles, concepts, and methodologies for effective supply chain management. Supply chain management is the integration of core business processes from the end user through original suppliers that provides products, services and information that add value for customers. The systems viewpoint and a process orientation are explored at the firm level and from the perspective of inter-firm collaboration among participants in supply chains. Case studies explore supply chain management and its critical role in business. The course provides opportunities to investigate important topics such as the bullwhip effect, the key approaches to planning and managing inventory across supply chains, the creation of value through alignment and realignment of supply chain capabilities, and the key supply chain performance metrics.After completing this course, students should have the knowledge, skills, and abilities to:a. Articulate the essential principles and concepts of the supply chain approach b. Understand the potential role of supply chains in creating value and in sustaining competitive positions of firms c. Explain the impact of the bullwhip effect on supply chain performance d. Understand the underlying causes of the bullwhip effect and articulate the principal approaches to ameliorating its impacts on supply chain performance e. Articulate differences in the principal approaches to managing inventories across supply chains f. Articulate the principal benefits and challenges associated with collaborative approaches to supply chain management g. Understand the principal metrics used to manage supply chain performanceThe evaluation of students is based on small group case study submissions, short paper and problem assignments, on-line discussion postings, and peer reviews. Alignment of suppliers with the strategic needs and direction of the organization. This course examines the alignment of an organization with its suppliers. Topics covered include an intensive analysis of outsourcing and offshoring decisions, evaluation and selection of appropriate transportation alternatives, determination of resiliency in the design of the supplier network, measurement of supplier performance and methods, and future issues and developments. An overview of the strategic role that supply management has in effective supply, demand, and value chain operations. SCM 822 provides an overview to the sourcing processes in supply chain management. The course focuses on the establishment of an effective supply base and relationships with suppliers. Specific topics include supply market analysis, spend analysis and supplier segmentation, supplier selection and evaluation, and buyer-supplier negotiation. Strategic planning for the source/buy process, including developing andmanaging supplier relationships, global issues, and e-procurement. Analysis, planning, and management of domestic and international procurement and supply activities. Professional and guided work experience in transportation and/or logistics with private or public organizations. Design and operation of global supply chain networks. Thomchick E. A., Smith P. M., Chen M., "Qualitative Insights Into Buyer-Supplier Relationship Attributes in the U.S. Biofuels Industry." Renewable Energy Focus, vol. 22, 2017, pp. 1-9. Thomchick E. A., Ruamsook K., "Research Summary: Biomass Crop Production Benefits from a Wide Spectrum of Marketing Opportunities." 2014. Thomchick E. A., Ruamsook K., Russell D., Coyle J. J., "The Real Impact of High Transportation Costs." CSCMP's Supply Chain Quarterly, vol. 8, no. 1, 2014, pp. 30-35. Thomchick E. A., Ruamsook K., "Potential Woody Biomass Supply Chain Scenarios: A Conceptual Study." Advances in Production Management Systems (APMS) 2013, Part I, IFIP AICT 414, 2013, pp. 416-24. Thomchick E. A., Richard T. L., Brownell D., Ruamsook K., Liu J., "Biomass Harvest and Logistics." Handbook of Bioenergy Crop Plants, (CRC Press), 2012, pp. 13. Thomchick E. A., Coyle J. J., Ruamsook K., "ENVIRONMENTALLY SUSTAINABLE SUPPLY CHAIN MANAGEMENT: AN EVOLUTIONARY FRAMEWORK." vol. XXXV, no. 2012, 2012, pp. 10. The manuscript was accepted for publication but is being withheld pending approval of the sponsor..
Thomchick E. A., Ruamsook K., "Sustainable Freight Transportation: A Review of Strategies." Transportation Research Forum 2012 Annual Forum Conference Proceedings, no. 2012, 2012, pp. 20, www.trforum.org/forum/proceedings.php?year=2012. Spychalski J. C., Thomchick E. A., "Drivers of intermodal rail freight growth in North America." European Jouranl of Transportation Infrastructure Research, vol. 9, no. 1, 2009, pp. 63-82. Thomchick E. A., Young R., Swan P., Ruamsook K., "Extending Landed Cost Models to Improve Offshore Sourcing Decisions." International Journal of Physical Distribution and Logistics Management, vol. 29, no. 4, 2009, pp. 320-335. Ruamsook K., Russell D. M., Thomchick E. A., "Sourcing from low cost countries: Identifying sourcing issues and prioritizing impacts on logistics performance,." International Journal of Logistics Management, vol. 20, no. 1, 2009, pp. 79-96. Ruamsook K., Russell D. M., Thomchick E. A., "U.S. Sourcing from Low-Cost Countries: A Comparative Analysis of Supplier Performance." Journal of Supply Chain Management, vol. 43, no. 4, 2007, pp. 16-32. Thomchick E. A., Ruamsook K., "Marketing Analysis Fact Sheet for Biomass Growers: Example Analyses of the Wood Chips and Paperboard Industries." Thomchick E. A., Ruamsook K., "Market Opportunity for Lignocellulosic Biomass: Part 1 - Multi-Tier Market Identification."